^ Christopher S. J. Walpole; et al. (1996). “Similarities and Differences in the Structure-Activity Relationships of Capsaicin and Resiniferatoxin Analogues”. J. Med. Chem. 39 (15): 2939–2952. doi:10.1021/jm960139d. PMID 8709128. ^ Szallasi A, Blumberg PM (1989). “Resiniferatoxin, a phorbol-related diterpene, acts as an ultrapotent analogue of capsaicin, the irritant constituent in red pepper”. Neuroscience. 30 (2): 515–520. doi:10.1016/0306-4522(89)90269-8. PMID 2747924. ^ Szallasi A, Blumberg PM (1990). 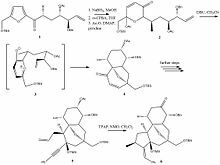 “Resiniferatoxin and its analogues provide novel insights into the pharmacology of the vanilloid (capsaicin) receptor”. Life Sci. 47 (16): 1399–1408. doi:10.1016/0024-3205(90)90518-V.
^ Szallasi A, Blumberg PM (1992). “Vanilloid receptor loss in rat sensory ganglia associated with long term desensitization to resiniferatoxin”. Neurosci. Lett. 140 (1): 51–54. doi:10.1016/0304-3940(92)90679-2. PMID 1407700. ^ Olah Z, et al. (2001). “Ligand-induced dynamic membrane changes and cell deletion conferred by vanilloid receptor 1”. J. Biol. Chem. 276 (14): 11021–11030. doi:10.1074/jbc.M008392200. PMID 11124944. ^ a b Wender, P.A. ; Jesudason, Cynthia D.; Nakahira, Hiroyuki; Tamura, Norikazu; Tebbe, Anne Louise; Ueno, Yoshihide (1997). “The First Synthesis of a Daphnane Diterpene: The Enantiocontrolled Total Synthesis of (+)-Resiniferatoxin”. J. Am. Chem. Soc. 119 (52): 12976–12977. doi:10.1021/ja972279y. ^ Seiple, I.B. (March 17, 2007). “Daphnane, Tigliane, Ingenane and Lathyrane Diterpenes” (PDF). scripps.edu. ^ “Resiniferatoxin– A Radical Approach – Chemical Science Blog”. blogs.rsc.org. ^ “Material Safety Data Sheet for resiniferatoxin, 2009” (PDF). ^ Brown, D.C. (2016). “Resiniferatoxin: The Evolution of the ‘Molecular Scalpel’ for Chronic Pain Relief”. Pharmaceuticals. 9 (3): 47. doi:10.3390/ph9030047. PMC 5039500. PMID 27529257. ^ a b “Resiniferatoxin – Sorrento Therapeutics – AdisInsight”. adisinsight.springer.com. 2019-01-24.